To understand what a parental consent is, we need to go back to the basics and define the term consent. Many people define this term as an initial agreement to do something. But that is actually wrong. The consent is just a permission that gives someone the right and authority to do something. As such, a parental consent form is a document filled out and used to give someone the permission to do something. And there are mommy Consent Forms that you can use for parental consent depending on the permission you have to give. Here is the list. 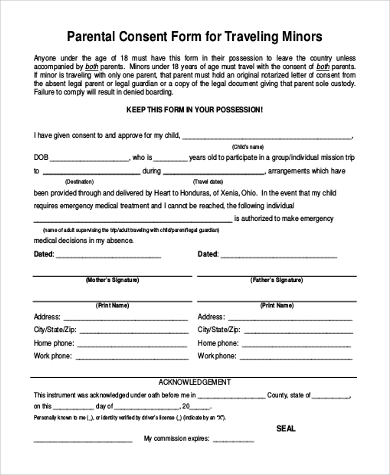 If you can no longer sponsor or support a child that is no longer yours, this might be the best form to use to terminate the consent to be a parent. The dame file is free to download and easy to use. If you do not have a problem with your child taking part in photography, then you should give your consent. The best way to do that is by filling this form and submitting it to the relevant recipient. You may also see Tattoo Consent Forms. Many parents don’t like their contacts being shared with anyone. But you may have to give a consent to receive emergency calls anyway. The best way to do that is to fill out this form. 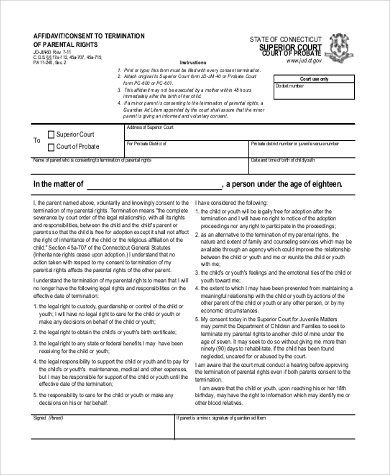 You can also see Parental Consent Forms. Kids under 18 cannot make decisions on their own. They need parental intervention. Especially when it comes to making a difficult choice. So, use a consent form to make decisions for them. 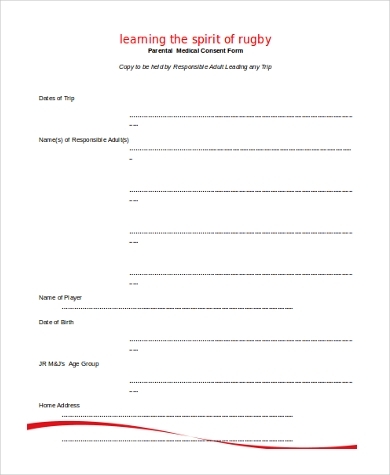 A medical consent form is a go ahead you give to a doctor to administer a treatment to conduct an operation. 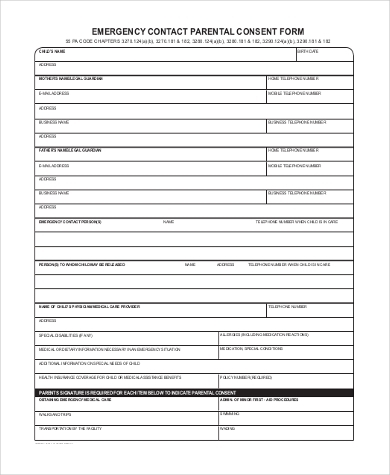 Here us the sample file that you can fill out to give consent for that. 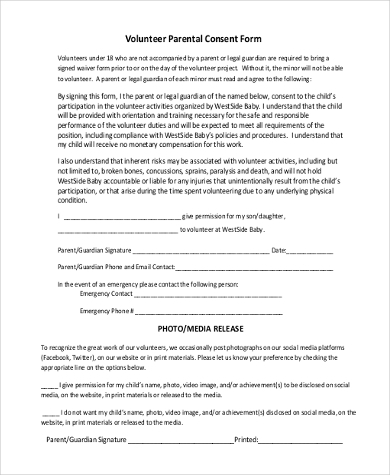 If you would like to become a volunteer parent and sponsor a child, the beat thing ti do would be to fill out the same form that reveals your consent to support the child. Here is the best form to use. You may also see Interview Consent Forms. Before you kid can go for a school trip, teachers always want to make sure you are fine with that. As such, it will be necessary that you fill out a consent form. Use this sample template to do so. 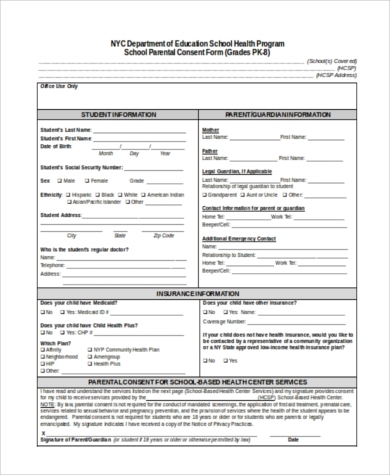 You fill out and submit this sample form if you would like to assume a parental role for someone who is in school. If the kid in question is your biological daughter or son, use it anyway. 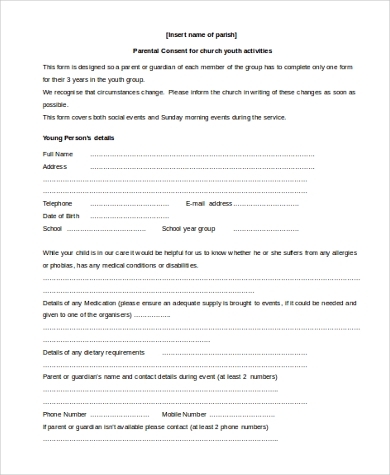 If you are fine with your kid taking part in church activities, then you can use the following sample form to give you consent. Of course, no parent would deny their kid an opportunity to take part in such activities. What is The Significance of Parental Consents? They help people to get the assurance that a parent is in complete agreement with the situation at hand. For example, before a doctor can release important medical information, they need to be sure that a parent is comfortable with the idea. So they will ask you, the parent, to give them the consent to go ahead and release the medical report in question. As such, you will have to fill out and submit a consent form as a sign that you are completely fine with the idea. 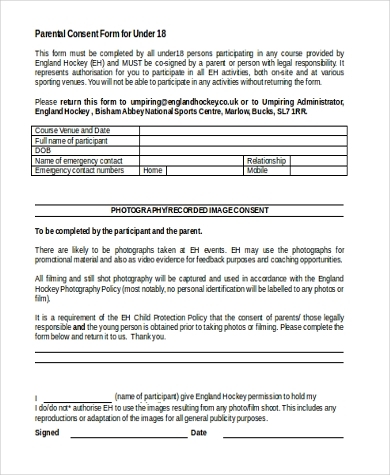 You may also see Child Travel Consent Forms. You can only fill out these forms if you are willing to give your consent. If you are not willing, then there is really no need to use the files because that would be a waste of your precious time. When asked to give your consent before something can happen, say before an emergency treatment, it will be a must that you fill out a consent form before an operation can take place. Keep in mind that these forms are available for free download. As such, you don’t have to spend a lot of time to try to create your own sample template for the same function. 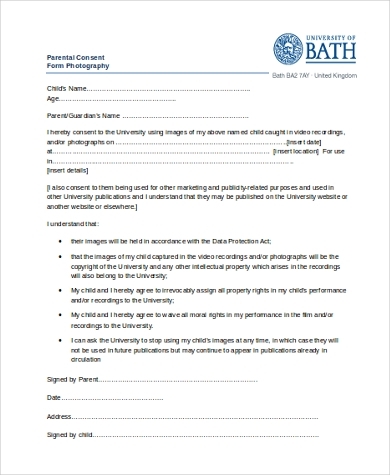 If you have no time to create a parental consent form from scratch, then these sample templates are the best for you. You just have to decide which same form you would like to use and then use it for free. In short, these sample files are a time saver, and there is always a perfect sample file for your exact needs. You can also see Questionnaire Consent Forms.